Want to dine where Jawaharlal Nehru, Nikita Khrushchev and even good old Queen Elizabeth II did? 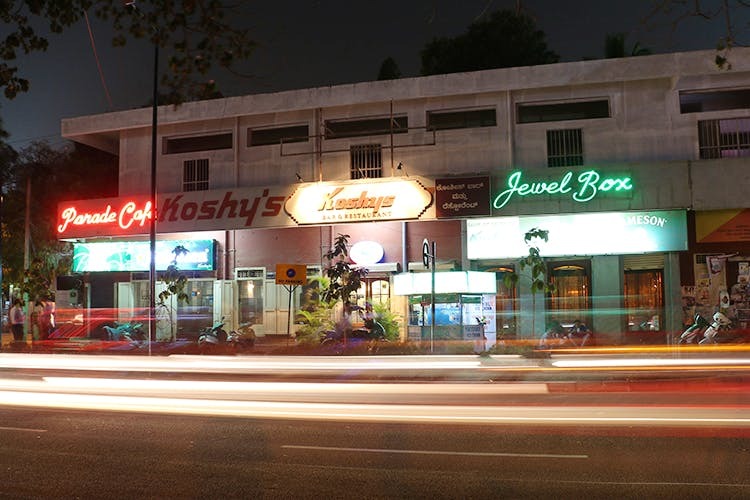 Set GPS to Koshy’s on St Marks Road. Many say that the food isn’t as good as before, and we’re inclined to agree on some counts. But, favourites will always be favourite, yeah? Like the Roast Chicken and Fish ‘n’ Chips. The former, soft inside and crisp outside arrives with lumpy (but delicious) mashed potatoes, chunky boiled veggies and gravy that maintains an amazing peppery standard all-year, every year. The fish is deep fried and the tartare sauce isn’t just mayonnaise. Throw in home-cut chips and you’ll feel like you’re in London. Prawn Biryani is another winner here. Spicy and full of masalas, with massive prawns in them, you best dig in with your fingers. Then, Appam and Stew for that traditional Sunday lunch with the family, or perhaps you’re the Ghee Rice and Fish or Chicken Curry kinds. Either way, expect spicy, greasy but oh-so-wonderful home-style fare that finds its way into your heart and memory. Breakfast is a legendary affair here. So their omelettes (from mushroom and bacon stuffed to mutton and Spanish versions), Mushroom on Toast, sausages and bacon (though fried in questionable oil) are a sure shot winner. Anytime of the day, their strong but milky Koshy’s Special Coffee will give you that much needed kick. For munchies, try the Chicken Liver on Toast and the Cream of Chicken Sandwich (and you thought it was only a soup). There’s also a smattering of Chinese, North Indian, Korean and baked dishes (Cheesy Au Gratin is good) for you to sample. Blindly opt for Caramel Custard with the perfectly burned sugar or the Peach Melba for dessert. Well, the quality of food, really! But you don’t necessarily only go here for food, but history (from the 1940s) and character. Brick red walls, hardly painted, with large fans creaking take you back in time. As do some of the regulars, who range from those around from the pre-Independence era to millennials with a vision.